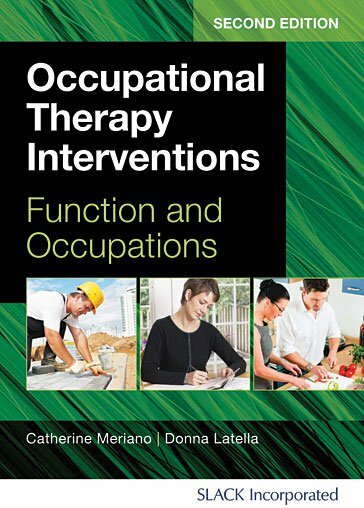 Occupational Therapy Interventions: Functions and Occupations, Second Edition is a unique and comprehensive text intended to provide the essential information required for occupational therapy practice in the physical approach to the intervention process. This practical and user-friendly text offers an entry-level approach to bridging the American Occupational Therapy Association’s Occupational Therapy Practice Framework, Third Edition with everyday practice, specifically concerning interventions. Dr. Catherine Meriano and Dr. Donna Latella focus each chapter of the text on an area of occupation, evidence-based practice, current intervention options, as well as a specific hands-on approach to grading interventions. Although the focus of the text is the intervention process, Occupational Therapy Interventions: Function and Occupations, Second Edition also includes a detailed “Evaluation Grid” which offers a unique approach to choosing occupational therapy evaluations. With the incorporation of new evidence-based concepts, updates to reflect the AOTA’s newest documents, and new hands-on approaches to interventions, Occupational Therapy Interventions: Functions and Occupations, Second Edition should be by the side of every occupational therapy student and entry-level practitioner. Catherine Meriano, JD, MHS, OTR/L is a tenured Professor of Occupational Therapy at Quinnipiac University, Hamden, Connecticut. Her clinical background is in acute care, outpatient rehabilitation, and nursing home practice. Catherine received her certification in Advanced Online Teaching from the Online Learning Consortium and teaches in both the Post-Professional Occupational Therapy Doctorate program, which is online, and the traditional entry-level Masters of Occupational Therapy program. Her teaching responsibilities include Legal and Ethical classes in both programs, Problem-Based Learning, Documentation of practice and Administration. Her publications and presentations have included topics such as evaluation of the upper extremity, dysphagia, academic integrity, legal issues in health care and legislative advocacy for occupational therapy. Catherine enjoys spending time in the clinic, traveling with her family, and spending time with her husband and two children. Donna Latella, EdD, OTR/L is a tenured Professor of Occupational Therapy at Quinnipiac University, Hamden, Connecticut. Her clinical background is in acute care, outpatient rehabilitation, homecare, and nursing home practice. Presently, Donna’s clinical practice is spent between homecare, outpatient, as well as working as a Registered Therapist in Hippotherapy and a Certified Therapeutic Riding Instructor. Her teaching responsibilities include Research, Adult Interventions, Health Conditions, Problem-Based Learning, Capstone Graduate Project, and Service Learning. Donna volunteers with her certified therapy dog, pot-bellied pig and horses providing animal-assisted therapy in reading programs, hospitals, and day centers. Her publications and presentations have covered topics such as evaluation of the upper extremity, dysphagia, leadership, service learning, animal-assisted therapy, educational malpractice, and learning styles. Donna enjoys jogging, horseback riding, and boating with her husband, two children, and many pets.